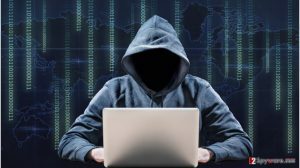 Ranion ransomware uses sophisticated techniques to infiltrate computers and hide from its victims. Use Reimage to determine whether your system is infected and prevent the loss of your files. Ranion is a HiddenTear-based ransomware virus that also operates as a Ransomware-as-a-Service. The virus was updated two times already. On September 2017, developers of malware introduced 1.06 version of the malware. One month later, v.1.07 variant was released. The newest version 1.08 shown up in February 2018. Ranion malware uses a strong encryption algorithm and appends .ransom file extension to the targeted files. Following the successful data encryption, malware delivers a ransom note where criminals demand to pay the ransom in order to get back access to the locked files. The news broke out about the Ranion virus when a security specialist Daniel Smith found the malware in a dark web. At the beginning of its emergence, the yearly access to the malware source code costs 0,95 BTC (approximately $1000). Additionally, buyers get the decrypter, anonymous C&C dashboard that can be accessed via Onion. What is more, hackers offer free customizations as well. Update February 2018. The latest version of Ranion was detected at the February 2018. Malware is executed on the system from the custom-2017.exe file and immediately starts encryption procedure. It appends the same .ransom extension to the files. 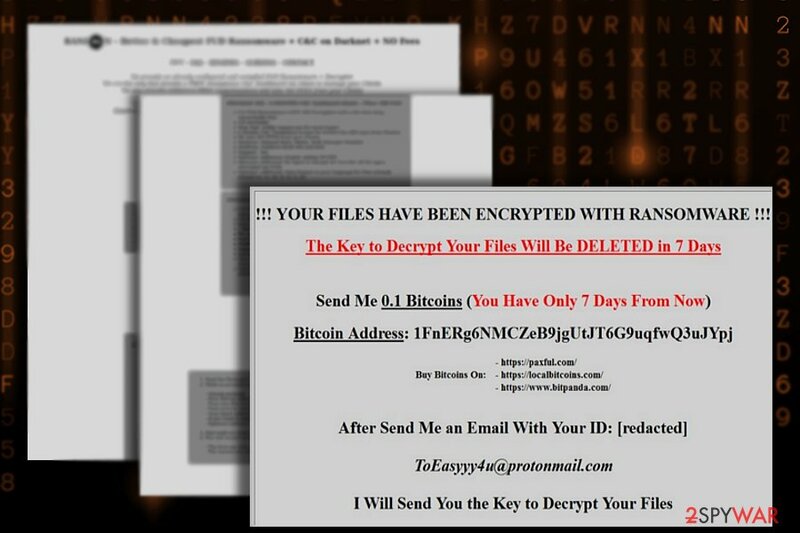 Following the encryption, Ranion 1.08 ransomware delivers a ransom note which is available in 8 languages, such as Spanish, Persian, Russian, Italian, Dutch and German. In the ransom note, crooks ask to pay 999 USD in Bitcoins in 7 days. After making the payment, victims have to send their unique ID number, which is provided in the note, to 0dayservices0@gmail.com email address. Authors of Ranion malware promises to respond with the decryption key. However, following these guidelines is not recommended due to the possible money loss. Update November 2017. Security experts discovered a new version of the Ranion ransomware. Malware is executed on the system from the ransom-cleaned.exe file. Just like the previous version, it also appends .ransom extension to each of the targeted files. Malware uses AES-256 encryption to lock the files. As a result, users are unable to open and use them. However, cybercriminals offer a shady way to restore data. Following data encryption, the Ranion v1.07 ransomware creates the README_TO_DECRYPT_FILES.html file where crooks demand to pay 0.3 Bitcoins in 7 days. After the deadline, the decryption key is said to be deleted. Additionally, victims are also asked to send their ID number via theaccountant@Safe-mail.net email as soon as they transfer the money. Paying the ransom is not recommended because it may lead to money loss. Crooks might ask for more money and never decrypt your files. Therefore, after the attack, its’ advised to obtain a security software and remove Ranion immediately. Update September 12th, 2017. It seems that the break since its appearance on the web was not wasted. The developers have struck again with a new Ranion 1.06 ransomware version, which leaves .ransom extension at the end of the encoded data. It seems that it may come with a counterfeited Minecraft game as it executes via MineCraft Hack + Setup TuT.exe file. It may come as Trojan.RansomKD.DBAD6A3, Win32.Trojan.WisdomEyes.16070401.9500.9979, or Backdoor.Ratenjay. Considering the latter, it is necessary to eradicate the infection as soon as possible since it manifests capabilities to function as backdoor, i.e. grant remote access to the device. The current version displays README_TO_DECRYPT_FILES.html file on a Desktop with further instructions of data recovery. the latest version demands 0.1 BTC, i.e. approximately $431 in exchange for the files. The perpetrator urges a victim to remit the payment within 7 days and contact them via ToEasyyy4u@protonmail.com. Despite the claims to retrieve the files, it is not recommended to pay the ransom but instead ,remove Ranion 1.06 malware. The malware, which contains the allusion to the characters Sprites from the animated film “Spirited Away,” claims to be the cheapest ransomware-as-a-service. Any user, who is willing to take the risk and enter the business, is granted the payload file. Afterward, he will receive the instructions how to access his Command and Control server. Now the malware targets a relatively small number of file formats. Nonetheless, the cyber villains are planning to expand the list. Interestingly, that the penetrators also offer the utility of encrypting .exe files. Ranion ransomware is able to encode files on all disks. It is promoted as the virus which is not detectable by the majority of anti-virus applications. 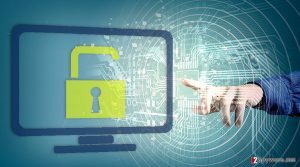 However, since the virus has been published on the dark market and now security companies may forward the emergency updates to prevent the damage. Furthermore, the infection does not differ much from other threats: it employs AES-256 algorithm. Previous cases revealed that the cipher creates great obstacles for decryptors. The dashboard of Ranion malware disclosed information about users identification codes, usernames, and each unique AES decryption software. However, getting infected with ransomware is not a deadly verdict. Ranion is presented as the crypto-malware created for education purposes. Interestingly, the bidders do not need to share their profits with the authors of this Ranion RaaS in contrast to previous cases when the developers demand ¼ of the profits. It is likely that some of the cyber hackers have already purchased the rights to the malware and spread the infection. If you happen to be infected, remove Ranion right away. You can do it with malware removal utility or look up alternative methods below the article. Such category of threats is transmitted via spam emails. Despite continuous alerts, the virtual community still falls for the trap opening counterfeited invoice, custom declaration forms, delivery emails. However, it is not difficult to prevent ransomware spreading in such case. Usually, such emails contain evident grammar and style mistakes. Full credentials are missing, or the copied logos have altered elements. Additionally, Ranion hijack may occur due to visiting an infected domain which possesses exploit kits. Recently, EITest scripts have been gaining popularity in delivering exploit kits. When a user visits a web page infected with them, the hijack by the ransomware becomes a matter of time. The exploit kits function on behalf of system vulnerabilities, so it is of utmost importance to update software regularly. Luckily, this cyber menace has not yet spread throughout the entire cyber space, but there are chances that it might have reached some users. If you happen to be one of the unlucky ones, start the automatic Ranion removal. For that purpose, Reimage or Plumbytes Anti-MalwareMalwarebytes Malwarebytes serves as a proper elimination tool. 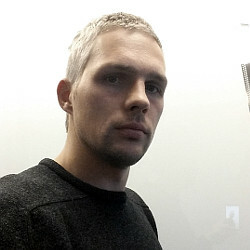 Since the penetrators may customize the threat according to their own liking, it is likely that the modified version might paralyze a computer. If you cannot control it, follow below-indicated instructions. Only when you successfully remove Ranion virus, you may consider initiating data decryption procedure. If the PC screen is locked or other vital functions stopped working, enter Safe Mode and follow the instructions. Log in to your infected account and start the browser. Download Reimage or other legitimate anti-spyware program. Update it before a full system scan and remove malicious files that belong to your ransomware and complete Ranion removal. If the above-suggested method does not help, perform System Recovery. When a new window shows up, click Next and select your restore point that is prior the infiltration of Ranion. After doing that, click Next. Once you restore your system to a previous date, download and scan your computer with Reimage and make sure that Ranion removal is performed successfully. Guide which is presented above is supposed to help you remove Ranion from your computer. To recover your encrypted files, we recommend using a detailed guide prepared by 2-spyware.com security experts. This program is specifically designed for locating damaged or lost files. It may also help you recover some of the encoded files. The key advantage of the program is that it recreates the files according to the patterns called shadow volume copies. They are created by the operating system. Luckily, few viruses are known to delete them. In short, you might stand a chance. ^ Karsten Hahn and Tilman Frosch. It's Educational - On the No 1 Argument for Open Source Ransomware. G Data Security Blog. ^ MineCraft Hack + Setup TuT.exe. VirusTotal. Free malevolent URL analysis service. ^ MalwareHunterTeam. So, it is Hidden Tear based. Note name (main): README_TO_DECRYPT_FILES.html Others: 2nd screenshot shows all names. Extension: .ransom. Twitter. Online source for communication and news. ^ Paul Rubens. How to Stop Ransomware. eSecurity Planet. Inteente Security for IT Professionals. ^ How does the encryption algorithm Rijndael (also called AES) work?. Password Depot. All about encryption. ^ JP Buntinx. New Spam Campaign Distributes Locky Ransomware and Kovter Trojan Simultaneously. The Merkle. IT News and Reviews. ^ Cat Ellis. How to block or remove ransomware. TechRadar. The source for tech buying advice . This entry was posted on 2018-03-05 at 07:18 and is filed under Ransomware, Viruses. You can quickly scan the QR code with your mobile device and have Ranion ransomware virus manual removal instructions right in your pocket. How did you remove Ranion virus?